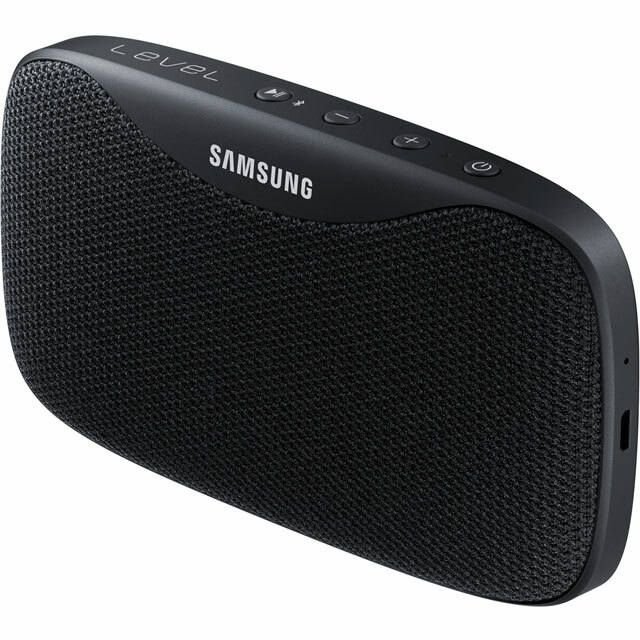 Take the party anywhere with this black Level Box portable speaker from Samsung. It connects via Bluetooth, so you can load up your favourite tracks from your smartphone, and with 30 hours of battery life you can be sure this model will last from dusk till dawn. You can use the speaker to take hands-free calls, with a built-in microphone making sure everything sounds crisp and clear when you’re chatting. It’s waterproof to a depth of 1 metre for up to 30 minutes so you can even break it out by the pool without worrying about it getting splashed. And, you can charge your smartphone or tablet from the speaker’s battery using the USB to micro USB cable, perfect for that quick power boost when you’re out and about. With Bluetooth connectivity, you can hook up to all your compatible devices without being held back by wires. Simply head to the Bluetooth menu on your smartphone or music player to get connected. Because it’s wireless, there’s a built-in battery which runs for 30 hours when fully charged. So you’ll enjoy constant entertainment throughout the day before needing to recharge. With a built-in microphone and call-handling, you can enjoy loud, clear sound while you chat. Simply hook up your phone using a wired connection or Bluetooth and, when someone gives you a ring, just answer it using the call handling button. It’s perfect when you need to make a conference call at work, or you’re busy in the kitchen and want to catch up with a friend while you cook.